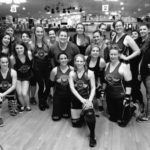 When I first tried out for the Charlotte Roller Girls in November 2015, I knew I was going to be joining a group of strong, empowered women. What I didn’t think of, or even realize, was that many of the women on the track are mothers. 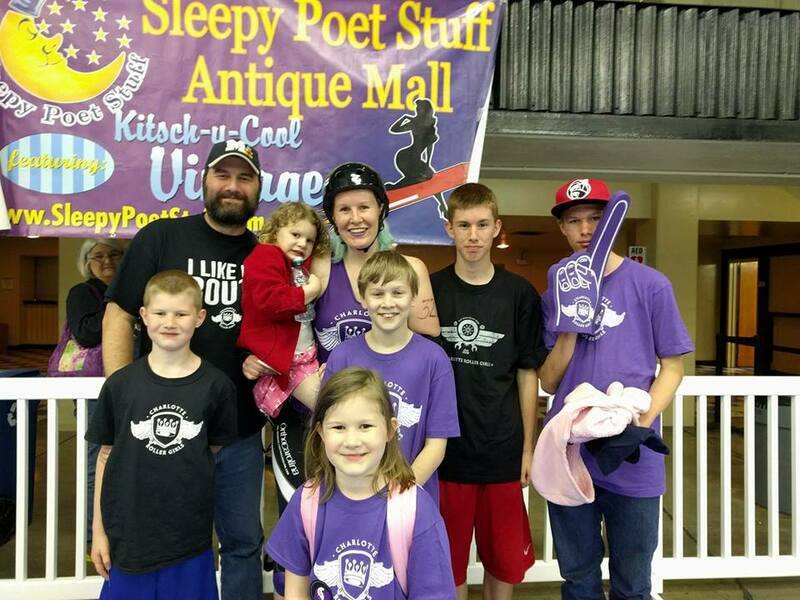 In fact our very own Squid Bait 320 (Janelle Rallis to the non-derby world) is the mother of six children. When I learned that I was blown away, but it also made so much sense. She has a very calming and supportive presence on the track. I imagine that wrangling six children at home is similar to working with your team during an intense bout. You need to stay calm and skate on. Squid Bait’s children are Joey, 15, Daniel, 14, Matthew, 13, Gabriel, 8, Alice, 6, and Charlie, 4. 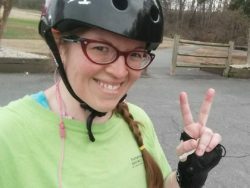 Her first introduction to the Charlotte Roller Girls was when she stumbled upon a bout flier in a Quick Trip bathroom. A few years later, she made the leap and tried out for the team. Her favorite derby moment so far was being able to wave to her kids in the stands at her first bout. And even though she had to “‘threaten’ the oldest with no computer time for a week” to get him there, he now wants to go to all of them. Her daughter Alice also regularly asks about mom’s next bout. I wondered if Squid had any advice to other moms about pursuing their passions, and she said, “Go for it. If you have the support at home to get out for a few hours at a time, you will not regret it. 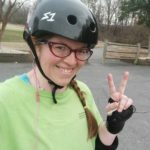 I think it helps make me a better mom because I get my me time.” And let’s face it, we all need me time, and me time on wheels is even better! 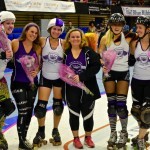 This Mother’s Day weekend (Saturday, May 7), you can come see Squid and our other derby moms bout at the Grady Cole Center. We are celebrating by giving out purple flowers to the first 200 moms through the door! 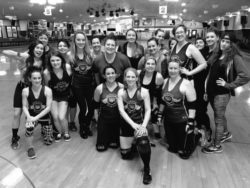 Derby Moms on our B Dazzlers roster are Squid Bat, Crashberry Jam, Knoxious Ness, and Poco Loco. 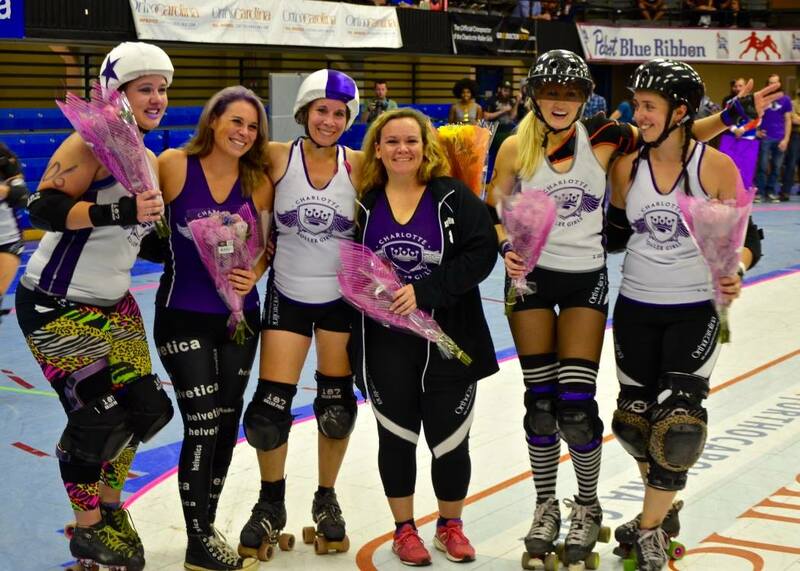 Our All-Star moms include: Madcap, Sarcastic Glitch and Blonde Crush.